Nintendo's most recent Nindies Showcase featured a lot of hot indie games for Nintendo Switch fans to salivate over, and among the top titles on display was Steamworld Dig 2, the sequel to developer Image & Form Games' popular mining-based platformer. The newest title in the series presents the familiar fan-favorite formula with a number of gameplay enhancements, and even better, the title will be coming to the Nintendo Switch soon, as the title is geared up to release for Nintendo's hybrid console next month. 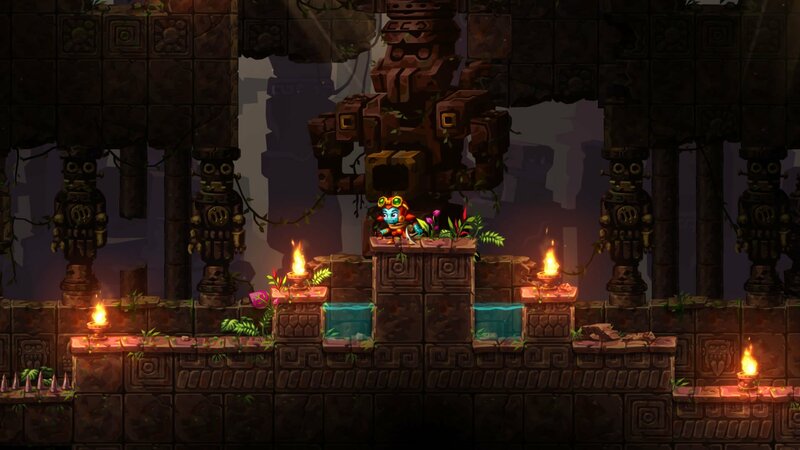 For all of the players who aren't yet familiar with the series, Steamworld Dig games drop players into control of a robot, in this particular instance a steam-powered robot named Dorothy, and tasks them with exploring and mining within procedurally-generated environments. As new items are mined or refined, new tools open up to the player, allowing for further exploration and increased rewards. To get a better taste of the game, check out Steamworld Dig 2's latest trailer, featured below. Steamworld Dig quickly rose to become one of the most popular titles for the Nintendo 3DS, not only for its polished presentation but for its randomly-generated nature, which helps bolster the title's replay value. There have been other spinoff entries to the series, too, including Steamworld Heist, a shooter title that released for the 3DS, PC, Xbox One, Wii U, and even PlayStation Vita, as well as Steamworld Tower Defense, the Nintendo DS title that kicked off the series in traditional tower defense style. Steamworld Dig 2 is slated to release for Nintendo Switch, PlayStation 4, and Steam-compatible PCs on September 21. The original Steamworld Dig was one of the more popular games to land on the 3DS. To discover more, check out some of the titles we've featured on our list of the Best Nintendo 3DS Games.